So much spoilers here. 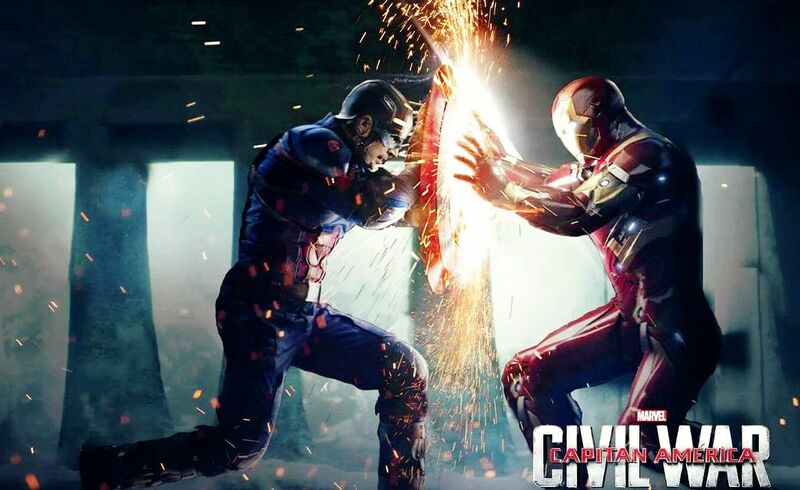 Please, if you haven't seen the Captain America III: Civil War, and don't want things spoiled for you, don't read this post. Just bookmark it so you can come back here once you've seen the film and we can have a good tête-à-tête. *wink* So much fangirling here, too, albeit as subtly as I can put it. You have been warned. I think this is—without a doubt—one of the most anticipated films for the year 2016. It's been several months after the battle of New York and the Avengers have often been seen on the streets, fighting crime and conspiracies, battling against bad guys who steal bio weapons, keeping hostile creatures at bay. Not all their missions have happy endings, however, and some even end in disaster, like the opening scenes of Civil War where, in trying to contain a bomb from exploding in a market place, Scarlet Witch diverts it to a building filled with people. This causes the leaders of the United Nations to ask "Who is keeping the Avengers in check?" The series of tragedies brings forth the Sokovia Accords which means that the Avengers can only operate under orders from the U.N. They are divided on the issue, with both sides of the argument having very compelling points, but, unlike the comics, which further explores the topic, this movie takes a different, more personal turn. I know some people who were quite disappointed with the film and with how the once-witty and snarky Iron Man has become the rather serious and vengeful one, especially towards Bucky; or with the fact that there's no grand battle like that of New York or Sokovia or even up there in some aircraft (such as in Captain America II: The Winter Soldier), and some feel that the issue they are fighting over is rather petty and insignificant. But, people, you're missing the point. First off, this film is directed by the Russo brothers, who tend to reflect a bit more depth in their characters and storyline than Joss Whedon (not saying that Joss doesn't show any depth at all). Of course, the wit and humour are still quite present, this time in the lines of Spiderman (who I unexpectedly loved in spite of my heart belonging to Andrew Garfield's adorable dorkiness) and Antman (who is indeed awesome-sauce and a great addition to Team Cap—take that, Iron Man!). And all those references to other Marvel comics, characters, and more! Second, things are getting more serious in the storyline because of the way the movies are going. I'm not going to pretend that I know everything where the Marvel Cinematic Universe is concerned. Most of what I have learned has been told to me by my brothers who are the ones who pore over the comic books and discussion sites and all that jazz. This whole series ends with the Infinity Wars, guys. And if that does not sound pretty cold and grim to you, well then, you should realise that the Infinity Wars is basically the ultimate war that the Avengers fight. Third, there is nothing petty and insignificant about someone who cannot move on from the past, as we see with Tony Stark. I felt a bit of pity towards him, especially as he seems to have so much going on his life—Pepper gone, the multiple disasters leading to the Sokovia Accords, Cap refusing to believe that Bucky was the one who bombed the meeting, some of the Avengers refusing to sign the Accords, etc. I think a part of his reaction is caused by everything piling up until it reaches a boiling point. The final explosion is caused by what he sees towards the end (not gonna say what it is) which, while it gives him closure, also opens an old wound. And just like that, he sees red. He does not know or see or care about anything. I can imagine only three things in his mind: a) his parents, b) the Winter Soldier, and c) the fact that his dad couldn't and wouldn't stop talking about Steve Rogers. Forget friendship, forget the Avengers, forget being on the same team, forget that Bucky was framed, forget that they're there to stop Zemo from resurrecting the other supersoldiers. He moves to take all of it out on Bucky and comes face-to-face with Steve instead, who does not hesitate to step up in defense of his longtime friend. Also there's a beautiful parallel in this movie to Captain America I: The First Avenger. Some of you will remember a scene when Skinny Steve goes to the movie house and someone is making a fuss at the clips they show of the American soldiers fighting the war. For Steve, it is a glorious moment to honour the brave, for the guy, it's a waste of time when all he wants to see is the movie. They fight it out in all the alley, with Steve all punched up and bleeding. When he falls for the nth time, the guy tells Steve that he (Steve) doesn't know when to give up, and Steve jumps and declares, "I can do this all day." In the third film, when Iron Man confronts his past, Steve defends Bucky. Iron Man punches him to the ground and warns him to stay down. But Steve gets up, and, wiping the blood from his face, says, "I could do this all day." He was fighting for an ideal then, and he fights for an ideal now. And for Steve, when he knows he cannot compromise, when it goes against everything he believes in, it is he who plants his feet like a tree—skinny or not, supersoldier or not—and he tells the world, "No, you move." I'm not going to deny that this is my favourite "Avenger" film so far. Maybe because of the action and the storyline. Maybe because of T'Challa aka Black Panther who I totally did not expect to like (also, I didn't know his identity, so jaw-dropping moment for me when he took off his mask). Maybe because of Steve Rogers' gorgeous arms. Maybe because it was oh-so-swoon-worth-I-could-melt-in-your-blue-eyes, Sebastian Stan—oops, sorry, this is is supposed to be a reflection post of my thoughts, not so much a fangirl rave. Kidding aside, I think the film touched a nerve, especially in light of the recent events happening in our country today, with the 2016 Elections just barely over. The past months have made going on social media and news sites so incredibly frustrating, so vexing. Words are exchanged, insults are hurled, differences are heightened, people unfriend other people and you are left to wonder why. Why is he so quick to dismiss a friendship over a matter he knows that people had no control over? Why are we? Why cannot we decide to put our differences behind and, even though we disagree, choose to never let the situation mean more than the relationship that we have? Why cannot we, as Cap did, after an argument, and choose to reach out and extend the olive branch along with the assurance that we will be there when we are needed? Why cannot we acknowledge our differences and still choose to respect the decisions someone else has made? Why are we so quick to judge without learning the full story? Why must we hold on to and nurse our grief and allow it to come between us? Why are we willing to give up years of friendship over just a small disagreement? Why are we so unwilling to swallow our pride and ask for forgiveness or even grant forgiveness, instead of finding a way to get even? I love how T'Challa comes to that realisation in the end, a realisation which, I hope, comes to us before it is too late: "Vengeance has consumed you. It's consumed them. I'm done letting it consume me." Funny, I actually took Stark's "so was I" as Stark thinking Steve didn't consider him as a friend anymore, not as Stark ditching Steve in that moment. Interesting. Your review just made me cry. Well, I cried a lot when the three of them were fighting. It was heartbreaking to watch.